The Pastor of our National Ukrainian Catholic Shrine of St. John the Baptist in the Nation’s Capital has assembled a very user-friendly collection of Bible verses that cover almost every aspect of the basics of Christian teaching. 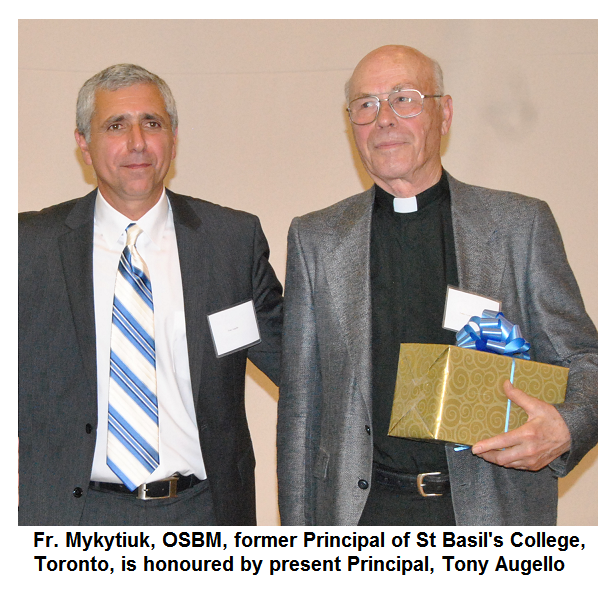 Basilian Father, Rev. Cyril Mykytiuk, an active priest for over 50 years and a long time teacher before being appointed pastor of the Shrine in Ottawa, has put together a very helpful teaching tool for those who seek a direct Scriptural source to compliment a more elaborate Catechetical explanation of a particular article of the Faith. Other sources of course offer this information in various ways, but the plus of Fr. Cyril’s layout is that it is found in one place on the Shrine website. As the new Church Year will soon begin - meaning the start of parish Catechism and adult religious education programs – faith teachers may find this resource very helpful to them and their students. The Introduction from the site…. - Acts 11/26: It was at Antioch that the disciples were first called ‘Christians’. - 1Peter 4/16: …. Yet if anyone suffers as a Christian, let him not be ashamed, but let him glorify God in that name. During the first century, the followers of Jesus never identified themselves by the term: christianos. They called themselves “the brethren”, or “the saints”, or “the disciples”, or “the believers”. However, by the second century, the derogatory connotation of this term was forgotten, and they began using it when speaking of themselves. The core teachings about Christianity are scattered throughout the different parts of the Gospels, making it difficult, if not impossible, for the occasional reader of the Bible to arrive at a full understanding of what Christianity is. The purpose of this work is, therefore, to collect and organize these teachings in a way that will bring the meaning of Christianity into clear focus. The quotations in this text are presented without any commentary or explanations, because the Bible is not primarily about intellectual understanding, but about spiritual understanding, and it is only by the gift and guidance of the Holy Spirit that the reader will attain growth in life and faith and spiritual understanding. - 2 Timothy 3/14-15: But as for you, continue in what you have learned and have firmly believed, knowing from whom you learned it and how from childhood you have been acquainted with the sacred writings, which are able to make you wise for salvation through faith in Christ Jesus. In the case of lengthy parts, as, for example, the parables, only the part containing the actual lesson is quoted in this text. The reader can turn to the Bible to read the full text. The quotations in this text are taken from the English Standard Version of the Holy Bible. Quotations selected and arranged by Fr. Cyril Mykytiuk, osbm.